As Portugal came out of its second unusually wet winter in a row, some people already fear these could be the first signs of global climate change. Can the seemingly endless rainy period be blamed on ourselves because we are driving our cars to work, heating and air-conditioning our homes, and flying on holidays or on business to Brazil? Undoubtedly the atmospheric carbon dioxide (CO2) concentration has been steadily increasing over the past 150 years. In its latest report released last September the United Nations Intergovernmental Panel on Climate Change (IPCC) warned of dire consequences should CO2-emissions not be drastically curtailed in the near future. Among the contributors to the IPCC report were also two Portuguese academics, Dr Pedro Viterbo, Director at the Portuguese Instituto de Meteorologia, and Professor Filipe Duarte Santos of the Lisbon University’s Faculty of Sciences, both serving as review editors for the IPCC. In conjunction with the report’s launch Santos warned that Portugal would be among the European countries most vulnerable to climate change. He suggested that the country in the future will suffer from more extreme weather events like heat-waves and droughts, which in turn will lead to more forest fires and reduced agricultural output. Santos prognosis sees an overall drop in rainfall but with the threat of short bursts of torrential rains that will raise the risk of flooding. Moreover, the Lisbon-based professor expects sea level to rise by more than half a metre before the end of this century, which would put two thirds of Portugal’s coastline at risk for a loss of terrain. Are these scary IPCC future scenarios really justified? This is an important question, especially as the European Union has decided to spend at least 20 percent of its entire 2014-2020 European Union budget on climate-related projects and policies – money that is already lacking in other fields. It is clear that the global temperature has risen by nearly one degree since 1850. A similar amount of warming has occurred also in Portugal, as evidenced by historic temperature measurements and geological investigations in the Tejo delta area. What is interesting, however, is that there has been no warming in Portugal over the last 19 years. This corresponds with the global situation, which has not warmed in the past 16 years, a situation that all of the IPCC’s highly praised climate models failed to foresee. Scientists have been taken by surprise and are now nervously discussing what might have gone wrong in their models. A first explanation emerging is that important 60-year natural ocean cycles apparently had been overlooked. Historical temperature data recorded by weather stations in Lisbon and Coimbra during the last 140 years confirm these stunning cycles. Hardly known today is the fact that around 1950 temperatures in Portugal were as warm over a ten-year period as they are today. And 60 years before that, during the late 19th century, another warm peak had occurred in Portugal, though temperatures were not quite as high as modern levels. Strangely many high temperatures recorded at many places around the world during the 1940s and 1950s have been “corrected” downwards recently by official climate agencies such as NASA’s Goddard Institute for Space Studies (GISS). Whether these data alterations are justified is today the subject of heated debate among some climate scientists. How stable was the climate before CO2 levels rose? To better understand the context of global warming since the industrial period started in 1850, it is also important to study pre-industrial temperature development when atmospheric CO2 concentrations were low and fairly stable at about 280 ppm. Obviously any change in climate during those pre-industrial times would essentially have to be owing to natural factors. Geological studies from all over the world have documented the occurrence of significant climate fluctuations during the last 10,000 years. Warm phases and cold phases alternated about every thousand years, often in sync with changes in solar activity. For example 1000 years ago, during the Islamic Period in Portugal, average global temperatures were at or above the present-day level. This period is referred to as the Medieval Warm Period and coincides with a phase of high solar activity. A research team led by Fatima Abrantes from the Laboratório Nacional de Energia e Geologia (LNEG) investigated this period and examined a sediment core they had drilled out of the Tagus delta. In their report published in 2005 in the Quaternary Science Reviews journal, the scientists document temperatures that were on average more than half a degree warmer than today for the Lisbon area. The water discharge of the Tagus during this time was less. Figure: Temperature development of the Tagus delta near Lisbon over the past 2000 years. From Abrantes et al. 2005. A few years later Fatima Abrantes and her team expanded their studies to the Porto area. Not surprisingly the data confirmed the existence of the Medieval Warm Period also at this location. In their study the researchers recorded persistently elevated temperatures between AD 960-1300 and documented climatic conditions for northern Portugal that were at times more than one degree warmer than today. Studies in Spain show similar results. Figure: Temperature development offshore Porto over the past 1100 years. From Abrantes et al. 2011. The warm medieval climate allowed the Vikings to establish settlements in Greenland. The King of Norway-Denmark at the time reportedly sent a number of white falcons from Greenland as a gift to the King of Portugal and received the gift of a cargo of wine in return. 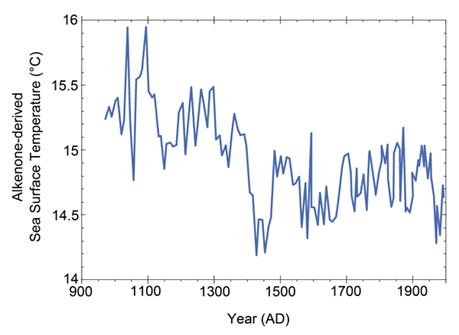 The Medieval Warm Period is one of the greatest mysteries in climate science. How could it have been so warm when CO2 in the atmosphere was so low? Climate models still cannot reproduce this warm phase or other warm phases that had occurred earlier. International scientists met in Lisbon in September 2010 to discuss this dilemma, yet the problem remains unresolved to this day. 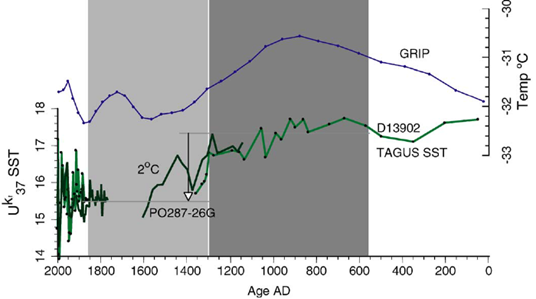 On a global scale cold phases prevailed before and after the Medieval Warm Period. The influx of Germanic tribes to the Iberian Peninsula at the beginning of the 5th century was triggered by the so-called Dark Ages Cold Period. A decrease in agricultural yields in the north contributed to the European migration. Living conditions were equally difficult in central and northern Europe during the Little Ice Age of 1350-1850 AD. Harvests failed regularly and disease spread. Temperatures in Portugal also fell, as shown by Fatima Abrantes and her team show. During some of these winters heavy snowfall was recorded in Lisbon, such as in 1665, 1744 and 1886. Solar activity during the Little Ice Age was unusually low and might have been the main cause of this globally cool period. Researchers at the University of Coimbra support the idea that solar activity is one of the key climate control mechanisms on timescales of decades and centuries. In cooperation with a Danish colleague from the Danish Meteorological Institute, Anna Morozova and Maria Alexandra Pais analysed temperature variations in Portugal over the last 140 years and found that solar activity changes had a significant impact on climate, especially during the winter months. Also little known is the fact that temperatures of 7000 to 5000 years ago were globally one or even two degrees warmer than those of today. This is a time referred to as the Holocene Climate Optimum. In collaboration with the Geological Survey of Spain, a scientific team of the LNEG led by Ana Alberto investigated the temperature changes of this natural warm phase using a sediment core extracted from the Atlantic sea floor about 300 km west of Portugal. The researchers confirmed the existence of this high temperature phase, which had been preceded and was followed by colder periods. The unexpectedly strong climate variability of the pre-industrial past indicates that the current climate models used by the IPCC underestimate the significance of natural climate drivers and thus greatly overstate the climate potency of CO2. If this is so, then the scary temperature warnings previously issued by the IPCC are unlikely to come true. Consequently it is not surprising that recently there has been a flurry of publications proposing that the warming effect of CO2 in the climate model equations should be reduced. According to the IPCC the so-called climate sensitivity – the warming that is expected to result from a doubling of atmospheric CO2 – is thought to be between 2°C and 4.5°C, with a best estimate of 3°C. However, a recent study by the Norwegian Research Council has drastically lowered these estimates and assumes only a value of 1.9°C. In the meantime other scientists and organisations have joined in calling for a downward correction, including the Austrian Central Institution for Meteorology and Geodynamics. The government of the Netherlands has urged the IPCC to include natural climate change processes more systematically and realistically in their models. In reality CO2 climate sensitivity values might actually be as low as 1.5°C or even 1.0°C once solar activity effects are fully factored in. Now that the IPCC future warming scenarios appear to be largely exaggerated, a multitude of other climate-related prognoses are looking more and more to be widely off the mark, e.g. those related to sea level rise, droughts, heat waves and storms. Based on theoretical considerations, IPCC scientists commonly warn of a sea level rising by half a metre, one metre or even two metres by the end of this century. The sea level data that has been measured at tide gauges along the coasts of the globe, however, tell us to be sceptical of such horror scenarios. Based on hard observed data, sea level has been rising by only about 1.0 – 2.0 millimetres per year. Sea level measurements in Cascais over the last 100 years have yielded a total sea level rise of about 150 mm, corresponding to 1.5 mm per year. There are hardly any vertical land movements in the Cascais region so that the measured sea-level value can be considered as characteristic for the Portuguese Atlantic coast. Interestingly, there has been no sea level rise acceleration in Cascais, or even globally, over the past 40 years despite a global warming of half a degree over the same period. If the present sea level trend continues, the sea would only rise only 10-20 cm by 2100, and not 50-200 cm as some scientists predicted. Some scientists claim that global warming would automatically lead to more frequent and more violent storms. Luckily there is a simple way of evaluating this scary proposition. As discussed earlier, temperatures in the past 10,000 years have been on a roller-coaster, with warm and cold phases alternating at regular intervals. Did these temperature changes impact storm intensity? The Caparica cliff-top dune on the Setúbal Peninsula south of Lisbon offers a good opportunity to reconstruct the storm history. Susana Costas of the University of Nebraska lead a team of researchers from the LNEG, the Universidade de Lisboa and the Universidade Lusófona in a study of the dunes and found five particularly stormy periods that had occurred during the past twelve millennia. Interestingly, all were related to climate cold phases. The last three of these windy phases coincide with the Little Ice Age and the Dark Ages Cold Period. Hence, empirical geological data do not support the simplistic idea that storm intensity in Portugal is increasing in Portugal as a consequence of global warming. The study by Susana Costa and her team was published in the Quaternary Science Reviews in May 2012. In 2009 researchers of the Pyrenean Institute of Ecology (CSIC) publicly warned that rainfall over the Iberian Peninsula would decrease over the coming decades due to rising greenhouse gas emissions. The basis for their claim was an analysis of precipitation data from Spain over the past 60 years which seemed to indicate a decline in winter precipitation. Only five years later, after several unusually wet Iberian winters, this prediction has begun to fail spectacularly. In particular the winters 2009/2010, 2012/2013 and 2013/2014 have turned out to be extremely rainy. What did CSIC scientists overlook? In 2011 the CSIC researchers found themselves what it was. They had obviously neglected an important 60-year oceanic cycle, the North Atlantic Oscillation (NAO) which had just entered its negative phase in 2009. The North Atlantic Oscillation is driven by the atmospheric pressure difference between the Icelandic low and the Azores high. It has been long known that winter rain in Portugal and Spain intensifies when this pressure difference is low, also refered to as a “negative NAO”. The NAO cycle began falling around 1990 and according to the 60-year cycle it is expected to remain at low levels for at least another decade thus bringing abundant rain to the Iberian Peninsula over the majority of the coming winters. Obviously it is necessary to study climatic data series that are significantly longer than the 60-year ocean cycles in order to identify longer-term trends. This is exactly what a Spanish-Portuguese team led by María Cruz Gallego did in a study appearing in the Journal of Geophysical Research in 2011. The researchers studied Iberian rains over a 100-year period and found the opposite of what was found by their CSIC colleagues: the total number of rainy days and that of light rainfall was generally increasing. In 2013 a study led by Dario Camuffo involving researchers from the University of Lisbon and the University of Évora further corroborated this result. The team analysed precipitation data taken from the entire Western Mediterranean covering the last 300 years and found no specific trends over the whole period despite a warming of more than 1°C. It may not come as a surprise that in their data Camuffo and his colleagues found evidence of a 60-year Atlantic oceanic cycle influencing rainfall activity in the study region. Over longer timescales of hundreds of years, Iberian rainfall was also affected by solar activity changes, as other studies show. Even the NAO itself is now assumed not to be oscillating fully independently, but is partly controlled by the varying energy output of the sun. Therefore the main rain drivers in Portugal and Spain are an Atlantic oceanic cycle and changes in solar activity. What role could CO2 play in this development? 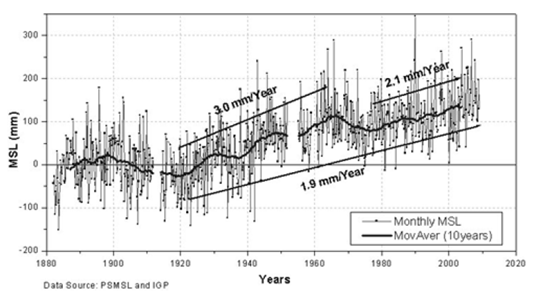 Has it possibly led to an increase in more extreme rain events? A study by the Institute for Environment and Sustainability by the European Commission investigated an increase in insured losses associated with river flooding occurring in Spain between 1971 and 2008. After adjusting the data for socioeconomic factors, the researchers found that there had been no significant trend in the frequency or intensity of river flooding in Spain. Societal influences remain the prime factors driving insured and economic losses from natural disasters related to flooding. IPCC-affiliated scientists have proposed that droughts in Portugal could become more frequent and intense in the future. However there are two concerns with this model. Firstly, this assumption is based on warming scenarios that are unlikely to materialise in reality because of an overestimated CO2 climate sensitivity. Secondly, calibration with historical drought statistics does not support the idea. A team from the Instituto Superior de Agronomia of the Universidade Técnica de Lisboa led by D.S. Martins studied the drought history of Portugal for the past 70 years and concluded that there is no linear trend indicating more drought events despite a warming of more than half a degree. Apparently there is no direct link between average temperature and drought frequency. In fact it seems that droughts were just as abundant during the pre-industrial past as they are today. A recent study by the Universidad de Extremadura analysed Iberian drought history during Muslim rule and identified three severe droughts: AD 748–754, AD 812–823 and AD 867–879. It is becoming ever clearer that the climate apocalypse so vividly promoted by some overly active scientists and organisations is not backed up very convincingly by scientific data. Theoretical models have failed spectacularly to reproduce the climate of the past. It turns out that climate has always been prone to natural variability, a fact that has been neglected for too long. Without a doubt atmospheric CO2 content will continue to rise and most probably also result in a long-term warming, but at a much slower pace than claimed by the IPCC. Such a modest warming is not necessarily only bad news, something that is often forgotten in the discussion. A study led by Célia Gouveia of the Instituto Dom Luiz at the Universidade de Lisboa for example found that vineyard yields in the Douro region will most likely increase because of the combined effects of temperature, rain and CO2 fertilisation effects. Another study led by João Vasconcelos of the Instituto Politécnico de Leiria in Peniche investigated Portugal’s excess winter mortality, which is the highest in Europe. The researchers found that cold weather has a significant negative effect on acute myocardial infarctions in Portugal, a health malady that would probably improve under mild warming scenarios. Meanwhile the public seem to have understood that the climate sciences have overplayed their hand. The people have had enough of dramatized reports predicting an imminent climate apocalypse just around the corner. According to a Eurobarometer poll conducted in July 2013, a mere 4% of the European population now cites the alleged climate catastrophe as their most pressing concern. Moreover, the number is zero percent in seven European countries, including Portugal. Attempts to bring back a more balanced discussion to the climate sciences have been undertaken repeatedly, but unfortunately with limited success. In 2011, for example, the Calouste Gulbenkian Foundation hosted a “Workshop on Reconciliation in the Climate Change Debate” in Lisbon, a worthwhile initiative that needs to be repeated. What is the best way forward? Firstly, we need comprehensive research on the underestimated role of natural climate drivers. Secondly, the likely warming pause over the coming decades due to declining ocean cycles and low solar activity gives us the time we need to convert our energy supply in a rational, systematic and sustainable way without causing massive energy poverty. In the UK and Germany, for example, power-station closures and huge expenditures for power systems to stand in as back up for highly volatile wind or solar energy or harmful ethanol production will only further boost energy prices. Volatile wind and solar energy pose the real threats of power outages and the crippling economic cost they would cause, all driven by fear generated by hysterical climate scenarios. We have the time for rational decarbonising. This may be achieved by cost-improved and competitive renewable technologies placed at the best European sites, through higher energy efficiency and by improving the use of conventional fossil energy. New technologies should be promoted through start-up financing, but have to survive on the market over the longer term without subsidies. The choice is no longer between global warming catastrophe and economic growth, but between economic catastrophe and climate sense.